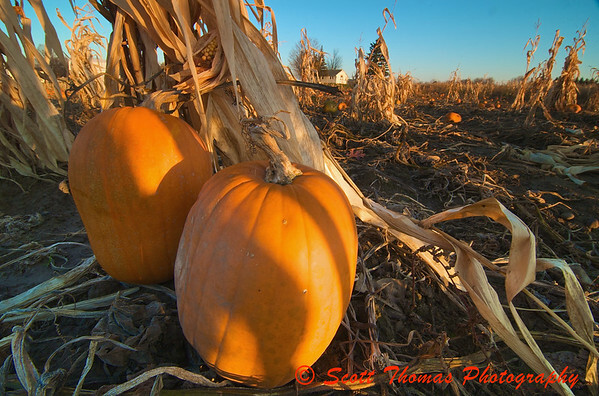 Pumpkins sitting in a field in November near Baldwinsville, New York. Not all pumpkins end up as Halloween Jack-O-Lanterns. Some are left in the fields to rot and be plowed under like the ones pictured above and below. I didn’t expect to show you these on such a clear and sunny morning. November is normally the cloudiest month of the year in upstate New York. So, this is an atypical look at November for my assignment on November. However, November does mean the end of the harvest and decay of what’s left behind and these photos definitely reflect that. 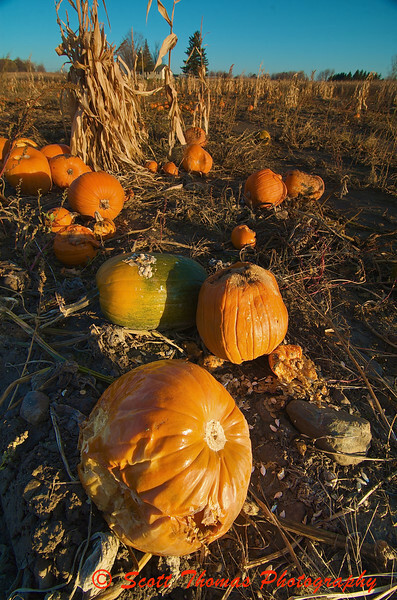 Rotting pumpkins left in a field near Baldwinsville, New York in November. I used my new filter to take these photos. The Tiffen 77mm Color Graduated Neutral Density 0.6 filter worked to perfection to cut down the bright sky by 2 stops and helped to balance out the exposure. This allowed me to expose for the pumpkins without blowing out the sky. The filter worked very well with the Tokina 11-16mm ultra wide angle lens. This entry was posted in Assignments, Weekly View and tagged 11-16, baldwinsville, blue, decay, filter, gradient, lens, neutral density, new york, november, orange, Photography, pumpkins, rot, sky, tiffen, tokina, wide angle. Bookmark the permalink. All those rotting pumpkins… how they glisten in the sunlight. This hasn’t been a typical November in Nova Scotia either. But with all this nice weather I can’t complain. It’s nice to see pumpkins in the field. Maybe we’ve had enough carved pumpkins with light inside instead of outside for some time. I like the contrasts here. Not only in color, but also in range(or distance) – as only the wide angle lens can capture the view. The colors are so vibrant. Great shots! Nice shots with the colors and perspectives. Good photos of what’s left behind. I still have a question about filter, mine came in 3 pieces, the FLD which gives a a pinkish tan glow, the CPL that I used at the Biltmore sky, and the UV clear one. Can you use more than 1 lens at a time, like the UV to protect the lens and add the CPL or FLD on top to that. Also if I use the UV for indoor photography, does that downgrade the quality of the photo if any? I guess I want to use it mainly to protect the lens from scratching. This is very confusing to me, thanks in advance.